This is the store in LA, near Hollywood. I got a set! I only want Maleficent and will be trading the other two so PM me if interested. My store has not received them yet. They said next week. Here's hopin. My store had received five sets. Now, only 3 remain. TheMickeyMouseRules, pincrazy and MerlinEmrys like this. Stalking to see when they show up online. Am I able to edit my RSP as many times before the due date, or is it once submitted, it's locked? So excited to go to my 1st Disney pin event! After you get the RSP pins, do you just trade with other people later on? Is there anything else to do there? 99% sure you can edit it. If you're concerned about it, you can always call them. They have always been incredibly kind and helpful when I have rsp issues. As for what else to do, there are preview boards and such, but mostly it's trading at the tables. Kerri780 and cyke23 like this. CCofRR13, summerskin, watzshakinbacon and 1 other person like this. Oh the SB box set is in stores? Maybe later today I’ll drag my carcass to the mall and check. Or maybe I’ll call first. I was expecting these midnight Monday. Glad I saw this, and glad they were still available when I woke up. CCofRR13, Drwholittle, Jack Skellington and 8 others like this. CCofRR13 and Jack Skellington like this. Oh no and I just spent all my box lunch money! Voko20, momin.ator, TheMickeyMouseRules and 1 other person like this. krand1276 and TheMickeyMouseRules like this. 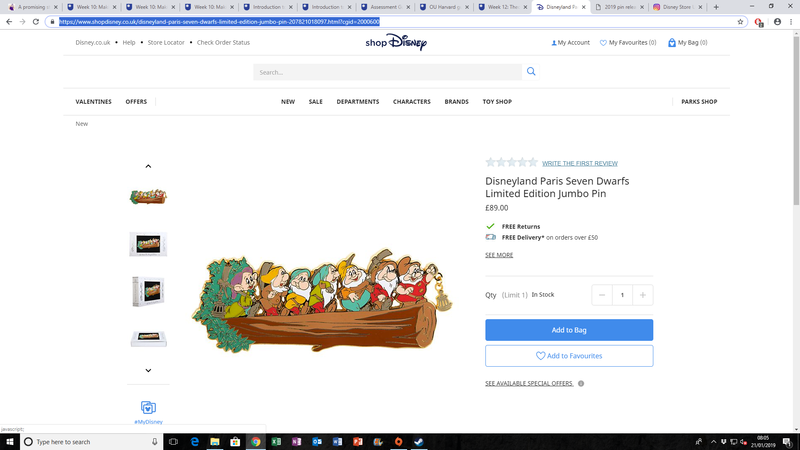 a different super jumbo available on ShopDisneyUK, looks similar to the LK one that got taken down, any idea @Mimachan ? Pin: H5.5 x W13.5cm approx. Packaging: H15 x W23 x D4cm approx. Edit> ShopDisney FR official accounts are posting about this pin and tell it's a Disneyland Paris pin but internet exclusive. I think it permit them to avoid Passholder discount on these. Now i'm pretty sure the LK pin will be in this huge and expensive jumbo serie. They didn't call it "les trésors de Disneyland Paris" but maybe they didn't adopted this name finally. BoxLunch online has the princess mystery dress boxes back in stock. Gives me hope the mickey mystery boxes may reappear... or really just appear since I have never found them online or in the store.